I thought this was interesting - an article from the Anchorage Daily News reported on Sarah Palin-backed candidate Joe Miller's win over Republican incumbent Sen. Lisa Murkowski in the GOP primary and how Miller's camp made baseless accusations against the senator. It's been disappointing this week to see the apparently baseless claims of a tainted electoral process in the Republican primary for U.S. senator. We shouldn't have to tell any campaign that it ought not to cry election fraud, much less attack the integrity of an opponent, without a sound basis. Republican senatorial candidate Joe Miller claimed for most of this week that there was an effort under way to skew the results in his primary election. His campaign accused Sen. Lisa Murkowski, or people working on her behalf, of engaging in unethical and perhaps illegal behavior. The campaign claimed that many absentee voters had been called by an unidentified Murkowski-supporting organization to find out how they voted -- for vague but nefarious purposes. So far, not a single identified person has stepped forward to say he or she received such a call or to answer questions about it. Unfortunately, that hasn't kept hysterical talk show hosts, or anonymous commenters on websites, from recklessly spreading such conspiracy theories. The campaign criticized last week's visit of a Republican lawyer to advise the Murkowski campaign about monitoring the count of absentee and questioned ballots. Campaign attorney Thomas Van Flein on Monday said a Murkowski consultant had access to the state's election management system, an accusation the Division of Elections says did not happen. I find it extremely interesting that Sarah Palin's lawyer, Thomas Van Flein, is an attorney for the campaign and was one of the people making these false accusations. It is very troubling that the far-right has made it a habit of making baseless accusations against their opponents, and it is even more troubling that they are seemingly getting away with it. Now that Miller was declared the victor and Murkowski conceded, the right is launching a preemptive attack on Murkowski to prevent her from splintering from the GOP and running as an independent candidate or for a third party. Big Government was quick to publish a post claiming that Murkowski is courting the Libertarians and that she only conceded the primary - not the entire election. Here are their words of encouragement for their readers: "The next 24-48 hours are critical. Sen. Murkowski is going away with her family. There is still time for the public voice it’s opinion." It looks like Big Government wants their readership to salt the earth so that Murkowski won't hurt their chances of getting a right-wing candidate into office. This is similar to what we saw play out in Florida months ago when the tea party, the GOP, and Fox News adopted Marco Rubio as the "it" guy and and threatened those among their ranks about supporting a non-GOP candidate while the governor was still campaigning as a Republican (they were operating off of the same right-wing rumors that will hopefully drive Murkoswki out of the party). Here is the funny thing - Big Government posted their story on August 31st claiming the Libertarian party may be a viable option for the candidate but an article a day earlier indicated that the Libertarian party was unwilling to back Murkowski. "Let's put this to rest; it's not happening," said party chairman Scott Kohlhass of backing the senator. The executive committee of the party unanimously voted to keep Murkowski out amidst rumors she may seek their endorsement - nobody from her camp ever approached the party about running as a Libertarian. It sounds like on top of salting the earth, Big Government is beating a dead horse. It also shows how ill-informed both the editorial staff at Big Government and their readership are. I find it interesting that up until last year, Palin supported Murkowski, but I guess things change when you sell your soul to the far-right. So it is okay for an elected official to quit halfway through their term but not concede? Wouldn't that be a sign of a true Mama Grizzly? I thought about this comment and thought that if a candidate were to run independently from the two major parties and were to get more votes, wouldn't that show that more people oppose the major party candidate? Also, I found it very interesting that they called Murkowski a whore - Joe Miller seemed to more closely fit the bill by getting the backing of national organizations, media outlets, and celebrity entertainers to beck his campaign. Shouldn't Miller be the one campaigning under a third party to show the establishment the door? I hope Murkoski continues in her run for office to prove more people support her over the right-wing plant - its easy for über-conservative candidates to win in their primaries where turnout is low and the base is more involved, but try getting the backing of the entire state. 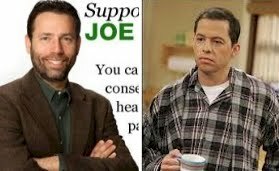 On a more enjoyable note, have you ever noticed that Joe Miller looks like Jon Cryer with a beard? 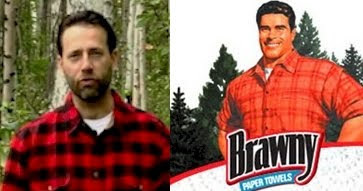 I do have to admit that Lumberjack Joe has a very well-produced commercial. He sums up all his attacks very clearly while walking through the woods picking up antlers, but I find it funny that he attacks Murkowski on things like her position on "Obamacare," which he criticizes her for not wanting to repeal the entire bill because it has some good things in it (a Republican statement I prefer as opposed to full "repeal" nonsense) - I guess Miller doesn't want to reform Alaskan's health care, which is considerably higher then the contiguous states (I believe the number is around 70% higher).